This afternoon I thought “There isn’t enough caramel in the world.” Specifically, my favorite candy bar the “100 GRAND” has the right balance of caramel, chocolate, and crispy rice in a bite size piece. Sadly the candy bowls on 3 floors did not have any 100 GRAND bars. As a poor substitute, I ate 2 Milky Way bars and 1 Twix. They had both had caramel, both totally unsatisfactory. Now I have to work harder during my daily swim to burn off the extra calories for choosing substandard caramel using candies. I have to double my swim from 1 hour to 2 hours. Double the work. When selecting USB controllers and PHYs, be smart. Pick the right controller, you will be satisfied. Pick the wrong supplier, and you’re working twice as hard to get the same result, and you just aren’t happy. The problem I’ve faced as a Product Marketing Manager over the last 18.3 years is we continually re-educate our buyers about our product. A new engineering manager starts off wanting to do the best job possible, at the lowest cost. They look at all the suppliers. They look all the same. They imagine all USB is the same. How hard can USB be? And I’ve got 2000 other blocks. We spend a lot of time explaining how our USB is different. How it’s clearly better. And why the biggest companies in the world rely on Synopsys for mission critical USB IP. Synopsys has been on every specification from 1999 until now. Because we participated in the writing of the specifications, and each revision and ECN, our engineers understand why the specification was written, the way it was written. Synopsys has knowledge of all parts of a USB design. Our engineers have intimate knowledge of how USB actually works in systems. How different operating systems or drivers work within a system of firmware, OS’s, hosts, devices, and even cables. Reason 3) The most broadly used USB IP in the world. Did I mention Synopsys is in 1000s of designs? Our customers tape-out a design every 2 days. So by the time you read my next blog, there will be 50 tape-outs (Or 3-9-ish). Our customers tape-out more often that I go to the gym. 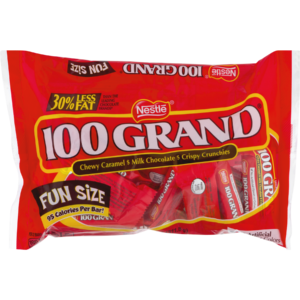 Our customers tape-out less often than I eat a 100 GRAND bar. It’s important because our customers have integrated, simulated, tape-out, tested, and retested our IP for millions of hours on top of our internal rigorous process. Our customers beat the snot out of the IP. And yes, SNPS learns and builds the IP better with each customer, each design. That’s it. The most experienced engineers, building all the parts of a USB design shipped and used in the most designs ever. This makes our IP the best USB IP in the world. An overused acronym for “You only live once.” There is an exception for those who believe in reincarnation or are cats. This post is filed under USB IP.